​How much exercise does you Drent need to be calm, healthy, and happy? Your Drent will need to be walked daily, preferably let out to run uninerrupted for an hour or more. A Drent needs an outlet; a cooped up Drent can become problematic, as they are very smart creatures that needs interaction. There are Drents being used in all kinds of upland and waterfowl hunting, tracking, agility, and canicross/bikejoring. What type of job/entertainment does your Drent need to be happy and stay out of trouble? Needs interaction of all sorts, a Drent loves to be involved with his people. Even if it is just sitting quietly nearby; Drents are soft tempered, stubborn, and hightly intelligent. Harsh treatment or training will not work well with this breed. Does the Drent have a strong prey-drive? Yes, the Drent has a very strong prey drive. As a Farm dog, there is a "Sharpness" that is present for him to get rid of little critters. Your Drent will work hard to find rabbits, and birds! Does your Drent ever chase after your house cats? YES, but a Drent raised with cats should make for a safe place for both cats and dogs. It is common to have some chasing, and with time and training the dog will have a healthy respect for the cat. How bonded to you is your Drent? More so than any other breed of dog I have kept. They are very sensitive to your needs, and strive to please you. Does your Drent need the company of other dogs/Drents all day to be happy? Yes and no, the Drent needs interaction with others, period. What breeders would you recommend? The DPCNA strongly recommends acquiring your Drent from a breeder in good standing with the Drentsche Patrijshond club from the country of origin where you plan to import from, to include Drents bred and born in North America. The DPCNA is committed to building a strong, balanced and vibrant breeding program in North America. 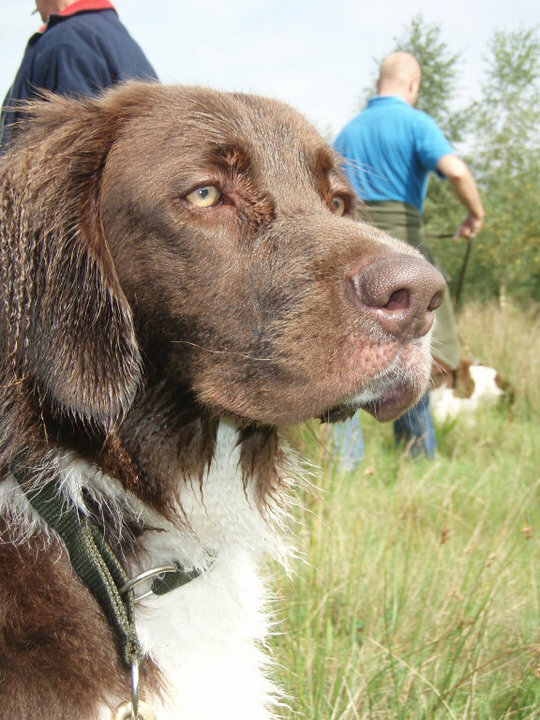 By using our database, and contacts with our parent breed club and foreign breeders the DPCNA is now in a position to be able to guide you in selecting a Drent, which not only should develop into a fine companion and gun dog for you and your family, but one that – if you were to choose to pursue breeding your Drent – could possibly become a part of the successful foundation to the DPCNA’s breeding program. Naturally, you are also free to search the internet for a breeder yourself. If you prefer to do that, always be sure to ask for the parent’s pedigree, show, and field trial results, hip/elbow certification grades, and specifics about how the breeder plans to raise their pups, and of course pictures. Be prepared to wait up to a year for your pup, this is especially true if you have a particular breeder you wish to use. At any rate, you'll then either need to make arrangements to fly to the Netherlands to pick up your pup, or pay the way for your breeder to deliver your new charge. How do I know that the parents of my North American bred Drentsche Patrijshond have met the DPCNA breeding stock standards? Simply ask the breeder for a copy of their Drent's DPCNA pedigree. In the header of the pedigree there is a space where it clearly states that the Drent(s) in question are Certified Breeding Stock. If it doesn’t say it and the breeder is making claims to the contrary, please contact the DPCNA Registrar. How can I enroll my North American bred and born Drent in the AKC's FSS program? It may be easier than you think. The following steps will help you get what you need to be able to have your Drent participate in AKC events. You will need a written statement from the breeder you obtained your Drent from. Stating who the parents were, the date of birth and in fact the dog in question was from their kennel. Send two color photographs (one front and one side view) with your statement the the DPCNA registrar. The DPCNA will review the details and notify you if it is possible to register your Drent with the DPCNA. If confirmed you will need to become a member of the DPCNA and register the Drent being discussed. You will then receive a pedigree which will be accepted by the AKC for joining the FSS program and AKC activities. What will the AKC's FSS program do for the Drentsche Patrijshond? For starters, the AKC has agreements with the F.C.I. and most National breed clubs, which will allow AKC registered and pedigreed dogs to be shown and breed with dogs outside of the U.S. closing this loop is one of the DPCNA’s top priorities. There is a lot of talk about the AKC - what about Canadian Drents and the Canadian Kennel Club? Since the Canadian Kennel Club currently does not recognize the Drentsche Patrijshond the AKC is allowing Canadian owners to register their Drents into the FSS Program. This actually helps to “kill to two birds with one stone” so to speak. Once the AKC fully recognizes the Drent obtaining recognition through the CKC will follow easily. What is the DPCNA up to now? 1. Remain Engaged with de Vereniging, actively seek their guidance and input with our fledgling club's direction - done, and ongoing. North American Breed Standard approved by the Vereniging in November 2012! Begin more formalized club activities; rescue, field trials, etc. - Have held 5 events to date (NOV 2018) more to come – anyone ready to VOLUNTEER?